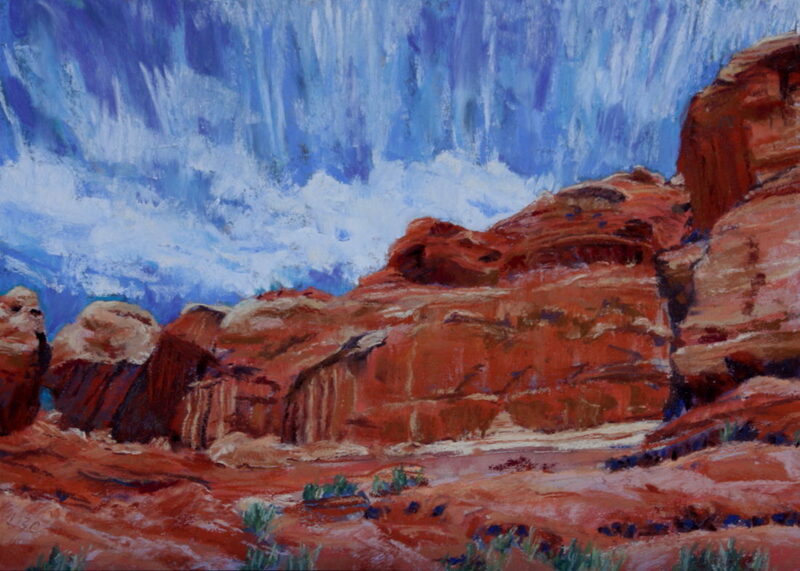 Society member and artist, Lyn Canham, member 45843, recently sent us this pastel painting entitled “Cirrus Canyon”. She told us “When I took the original photo in one of the myriad of side canyons in Canyonlands National Park in southeastern Utah, USA, I was struck by the vertical-striping cirrus beyond the gorgeous sandstone rock wall, which contained echoing vertically-striped water stains. My husband and I just love backpacking, camping, and hiking in Canyonlands, and we love its weather – but not in summer! In general, one of my favorite painting subjects is CLOUDS – of all kinds”.